Anyone any info or know of any websites on how fullers where put into sword blades? Ive heard referance of something known as an old maids tooth - I take it this was a file of some sort. Also anyone know an easy way i can put a fuller on the wallhanger im currently making, was thinking about using a grinder? I'm fairly certain I've seen a video of an armourers workshop where they're putting a fuller in a blade with a hinged device which is possibly the "old maid's tooth" you mention. A protrubance from the lower arm slots into a hole in the anvil and it's upper face is curved into the shape of a negative fuller. The lower face of the upper arm also has a negative fuller and the upper side a hammering surface. The blade is heated to the appropriate forging temperature and placed between the negative fullers and somebody else hammers on the top while the armourer fulls the blade through, which impresses the fuller into both side of the blade. That said, most of the people I know who make swords, professional and amateur, use stock removal with an angle grinder. Forging, where available, costs lots extra and most modern consumers are put off by the irregularities that often result. Modern homogenous alloys and the "perfect" finish produced by machines has trained us to see such things as faults instead of a natural feature of the manufacturing methods and therefore more accurate, certainly in munition grade weapons anyway. As Inspector Clueso would say...'Very Interesting'. Sounds pretty logical to me. As andrea described perfectly fullers are but in using a tool not called an old maids tooth but in fact a "fullering tool" they are infact used in making old files and rasps. They work in much the same way as the little medieval snips but basically with two rounded chisels set perpendicular to the sprung section. However for the wall hanger begin by using an angle grinder. For a straight edge g-cramp a section of wood or similar straight edge and run the angle grinder blade down it a few times. Then use flap discs to make your finishing easier. You can take metal work and forging classes at night in places like Belfast Tech or similar and they have all the tools you will ever need to forge from anvils to hammers, thats where I got to play with the fuller. Hope this helps. An "old maid's tooth"? Interesting name for a "fuller". But then again, you call "C-Clamps", "G-Clamps" so there's probably a ton of different names for the exact same tool we use over here. There are a wide variety of fullers, but basically a fuller is positive forming tool (as opposed to a swage which is a negative forming tool). All are "struck tools", not "striking tools", some are used in pairs either hinged, sprung, or as a hardie & handled set. 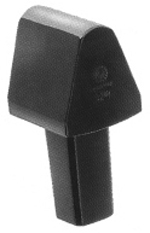 Hinged fuller - In this case the fuller is being used to isolate blade material from socket material of a spear head.